A dog’s natural instinct is to seek and chew bones. 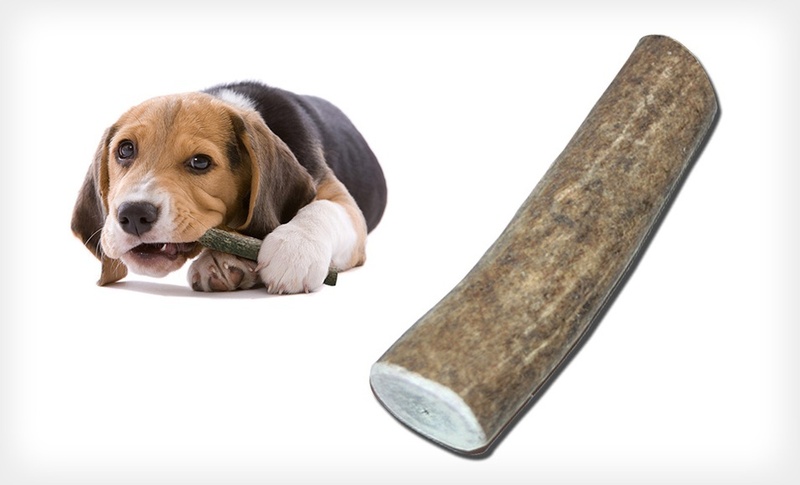 Antler is bone, however it’s important to note that it is not like skeletal bones in that it does not have a soft center, making it nearly impossible for your dog to break or splinter. Your dog’s chewing action and the digestive action of their saliva softens the hard antler and allows them to slowly bite off yummy morsels! They are rich in calcium and other nutrients (like phosphorus, potassium, sodium, magnesium, iron, zinc and manganese) your dog needs to grow and be healthy. The antlers we carry are not chemically enhanced and they do not contain any dyes or preservatives. They are naturally shed from animals in the wild. These antlers are just as nature intended them to be. The only processing that is done to them is to power-wash dirt residue using water only, cut off the sharp points and cut them to size. They are not stinky or messy like many chews on the market (making them appealing to you as the owner), but they do have an appealing scent to your dog. We carry moose, deer and elk antlers and while each type has some minor variations in size, shape, etc., the real difference is undetectable to us. But your dog’s extra-sensory nose knows. Your dog will notice the difference in the scent of each, and may actually prefer one over the other, but from a nutrient standpoint…they’re all equally as healthy. It is important that you give your dog the appropriate size antler. We carry sizes for the smallest of small dogs to the largest of large dogs, and would be happy to help you choose the appropriate one for your dog. Remember that once an antler has been worn down to a size that can be hidden inside your dog’s mouth, it is time to throw it out. We DO NOT recommend antlers for puppies who have yet to fully develop their full set of adult teeth or adult or senior dogs with weak or worn teeth.